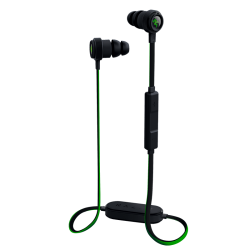 The Razer Hammerhead In-Ear Headphones are in-ear monitors (IEM) engineered from the ground up to set the standard in portable gaming audio. Machined out of aircraft grade aluminum, the Razer Hammerhead embodies ultimate durability packaged in a lightweight, comfortable form factor. Encased within each sleek, brushed shell is a high performance, precision-tuned 9mm neodymium driver. Paired with an optimized inner acoustics chamber in each shell, these in-ear monitors produce a sound signature that packs a mean, earth-shattering bass while maintaining crystal clear mids and highs. The Razer Hammerhead comes through with a full-bodied low-end frequency, pounding in the beats without distortion.